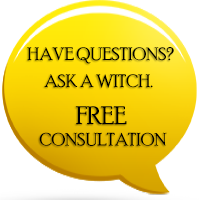 Every Magickal practioner has a set of preferences individual and customized to their own needs. Although they can be stored in the form of disks or even typed parchments, some follow the tradition of writing them manually. Those who prefer writing them manually use mysterious forms of alphabetical letters or Magickal Alphabets, which is somewhat different from the regular letters and alphabets we are accustomed to. The reason for this is so the privacy of the events and incidences is well safeguarded lest the Book of Shadows fall into the hands of unscrupulous people. As a tool the Magickal Alphabets are used as inscriptions and we aim to help you understand the truth behind these mysterious alphabets. Today, witches and wizards across the globe use the power and protection of Magickal Alphabets. The most important reason they say would be to protect the Magick and the potency involved. Names and words which have power in them are written in the form of these mysterious alphabets and it is said to have a force and energy greater than what a common letter would. Apart from this, Magickal Alphabets are also used for the reason to conceal and not to be understood and deciphered by those that cannot control that level of Magick. Spells, charms and the likes are written with the help of these alphabets and are not understood by someone who doesn’t understand the realms of Magick, not even the strongest charm can decipher them, no matter what the claim. Witches and wizards say that the second reason adds more weight to the theory of Magickal alphabets. Magick is mysterious and not for everyone to know or to understand, unless the Goddess or the higher forces have blessed them with the powers to know of the beyond. Responsible mentors know that not everyone is capable of all Spellwork performed in a safe and suitable manner. Those who practice the use of the Magickal alphabet know that it adds a greater potency for any Magickal workings. Language, specifically written language, has taken mystical forms at times and can even be seen in the Mayan and Egyptian temples today. Long ago, much before our forefathers and their forefathers, there were many old forms of rituals and practices that were hidden in the form of a sacred alphabet unknown to most. It is said that ancient Greece historians considered the art of hieroglyphic writing as magic, as seen in the tombs of the pharaohs of Egypt. 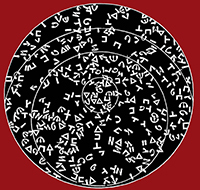 Some say one language, Hebrew, which is now fast dwindling, was considered to be Magickal; sources even show evidence of charms from Greece Gnostic forms as powerful Hebrew connotations. During the Ptlotemaic Period many vowel sounds were considered to be powerful and infused by the creators of charms and amulets. It is said that the energy around came to life with the string of intelligible chants from vowel sounds brimming to the ears of many involved. Kabbalah allowed the letters in Hebrew to have a life of their own, believing maybe a nearby spirit or an angel, was bringing energy to the letters that are now symbolic. But all these writings faded while the Dark Medieval ages around the European continents emerged. The images and alphabets were now used as an embodiment of power and change, famous ones known were the Tetragrammaton which had four Hebrew letters. It is said that each Magickal alphabet contained power which only the creator or those initiated into Magick would understand. Signs of the Occult and symbols known as sigils were named after stars and demons. Obscure notations like the Grimoire, started out as living letter and through time became so copied centuries after centuries that the potency faded and now cannot be understood or deciphered by many. 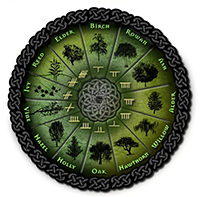 The Celts in the ancient days would use the Tree Ogham and it was a composition of straight lines that formed right angles at the edges and each had a name for a shrub or a sub species of vegetation. They were then cut and shaped into blocks and kept in parallel lines, five each, only to be used for Magick. Finally other forms of Magickal alphabets involved Runes and parchment writings in the forms of birds and animals. It is important to know the relevance behind each of these symbols or alphabets before they are used. Or else you don’t know what would be waiting in store for you and with what intent were they created. Hence the knowledge of Magical alphabets in Wicca is known to be used for the craft of the wise. Hi!Nice article but for some reason the graphic for the aura cleansing ad is over top of the words in the article. Must be a text wrapping issue. Just thought you might like to know. Wow I have rectangular Amulet that looks just like the top alphabet Somehow my father got it and now I have it I cannot decipher it! I wish I knew what it says it is Gold can anyone assist me with trying to figure out what it says and what purpose it serves? Great article! I've always wondered about the different alphabets. This was explained wonderfully! Thank you so much.